For as long as I can remember, I have enjoyed playing and listening to music. However, I had never considered music as a lens to view the past. It was during my time as an undergraduate student at Nipissing University that I first became interested in studying music when I wrote a course paper that examined popular songs in the United States during the Vietnam War. My longstanding interest in the experiences of Canadian soldiers and civilians during the First World War led me to explore music in wartime Canada for my Masters research. As I began to read the secondary literature, I recognized a gap in scholarship on Canada and the First World War. While historians were increasingly studying wartime culture, in the case of music the focus remained on soldiers’ songs and highbrow music composed for the upper class at home. But I was interested in the music that was more accessible to the average Canadian during the war. Thus, I maintained a focus on Anglo-Canadian popular songs composed on the home front during the First World War. In both an aural and visual sense, music was significant to the First World War experience on the Canadian home front. Through the lyrics, music, and cover art of popular songs, composers and publishers appealed to Anglo-Canadians with messages they believed would resonate with their audience. Those in the music industry aimed to sell sheet music and records, or have their songs played during recruiting events and other live performances. Through my analysis of the sheet music, three central themes emerged: supporting Britain and the Empire, Canadian nationalism, and gendered language and images. From the early years of the war, there was an emphasis on the historic ties between Britain and Canada in order to encourage voluntary enlistment. The patriotic messages found in this group of songs were directed at Anglo-Canadians, who were expected to show support for King and country in wartime. Most of these patriotic songs were composed in typical march form with an upbeat tempo, evoking a stirring call to action. (Original recording by Herbert Stuart features a bugle call and drums, marking it clearly as a patriotic song in support of the British Empire at war). 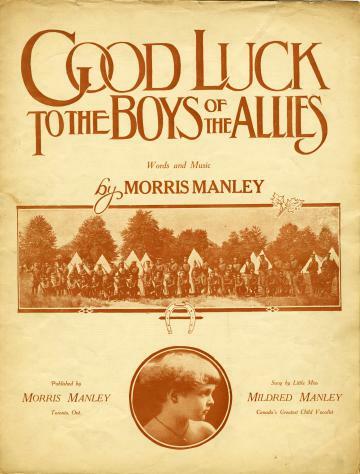 One of the most successful Anglo-Canadian popular songs produced during the war was “Good Luck to the Boys of the Allies,” composed by Morris Manley in 1915. This marching song encourages those on the home front to support enlistment and offers “good luck to Johnnie Canuck, And all the Allie soldiers.” The song emphasizes a duty to Britain and fighting for the Union Jack. A distinguishing feature of the song is the inclusion of the melody of “God Save the King” to accompany the lyric “God save our gracious King.” This song suggests that composers and publishers believed an emphasis on imperial ties would be a motivating force for enlistment and support of the war by Anglo-Canadians. Sheet music cover for “Good Luck to the Boys of the Allies.” Source: Morris Manley, “Good Luck to the Boys of the Allies,” (Toronto: Morris Manley, 1915). There were efforts during the war to establish a sense of national identity, and music was one way to promote common values amongst Anglo-Canadians. One of the distinguishing features of Canada described in popular songs was the country’s vast landscape, in order to emphasize that those from ‘coast to coast’ supported the war. Another common element of popular songs that tried to establish a national identity among Canadians was the symbol of the maple leaf, which was often incorporated into images on sheet music covers. 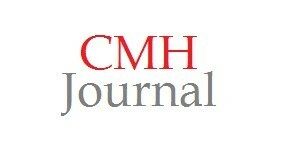 (This recording was produced through the efforts of Jonathan Vance at the University of Western Ontario. The singer is Western alumna Kelsea Meredith, accompanied by Debbie Grigg, a pianist from London, Ontario). The song that, perhaps, best characterized a Canadian national identity is “I Love You, Canada,” composed by Morris Manley and Kenneth McInnis in 1915. The cover (pictured below) features a colourful map of Canada, establishing the song as a Canadian tune. This song was very successful, and was ideal for sing-alongs, as the melody is simple, within range for the average person to sing, while the lyrics are overtly patriotic. The song was unique for its time because there is an absence of British and imperial symbols, with the focus remaining on Canada throughout. Many of the popular songs composed in Canada throughout the First World War expressed gendered notions of war. In wartime society, it was important for Anglo-Canadian men to demonstrate their ‘manliness,’ and popular songs were one way in which the message of being ‘manly’ and enlisting was promoted. A woman’s role was to encourage men to enlist, and many popular songs evoked these gendered roles for Anglo-Canadian women. 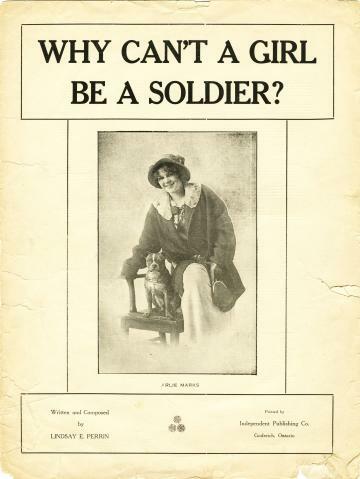 "Why Can't a Girl Be a Soldier, 1916"
While many songs reinforced the idea of separate spheres in wartime, with men fighting on the front lines and women waiting on the home front, one song questions “Why Can’t a Girl Be a Soldier?” This song, composed by Lindsay E. Perrin, considers the contribution women could make as soldiers because they can “carry a gun good as any mother’s son.” The song’s lyrics are clearly from the perspective of a woman on the home front in Canada, suggesting that some women felt they should be allowed to contribute more to the war, while still maintaining a ‘feminine’ physical appearance. Despite the view this song represented, wartime roles continued to be assigned along typical gendered lines in Canada. Throughout the research process, I found myself considering the questions, “Why should we study music of the past?” and “What is it about music in particular that can help inform our understanding of history?” I think the answer lies in the continued relevance of music in the present day. Songs continue to reflect attitudes towards world events and are shaped by various social factors. Therefore, music is a relatable way for experiences of the past to be translated to contemporary audiences. Note: For more information on this topic, links to resources, and recordings of other popular songs, see the author’s website: https://sarakarn.wixsite.com/songsofwar. For more songs of the First World War click here. 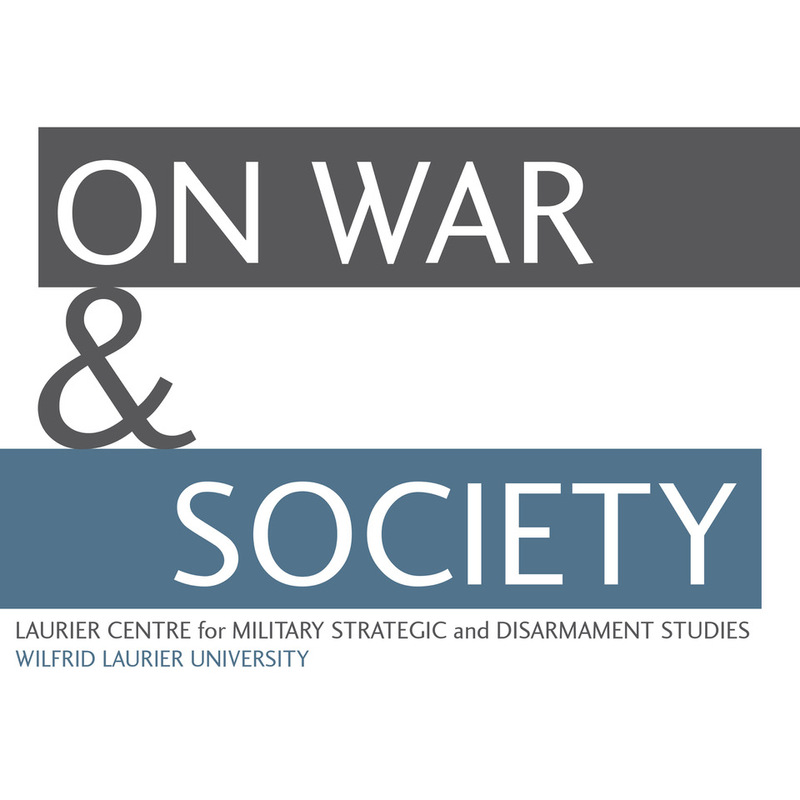 Sara Karn is a recent graduate of the Tri-University Graduate Program in History at Wilfrid Laurier University. Prior to attending Laurier, she earned a BA and BEd in the Concurrent Education program at Nipissing University. Governor General Vincent Massey, “Foreword,” Music in Canada, edited by Ernest MacMillan (Toronto: University of Toronto Press, 1955), v.
 Morris Manley, “Good Luck to the Boys of the Allies,” (Toronto: Morris Manley, 1915), sheet music, the Ley and Lois Smith War, Memory, and Popular Culture Research Collection, held by the Department of History at the University of Western Ontario (hereafter UWO). 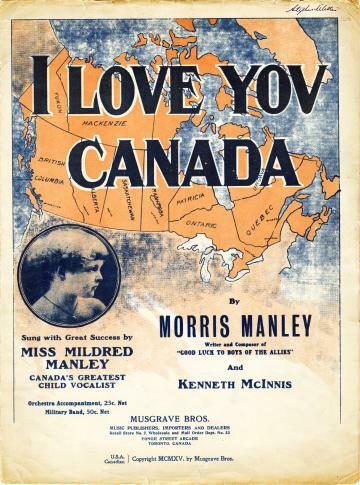 Morris Manley and Kenneth McInnis, “I Love You, Canada,” (Toronto: Musgrave Brothers, 1915), sheet music, UWO.